These coins were struck at three different mints. The ones struck in Birmingham at King's Norton Metal Company are marked with K N near the edge. At Heaton Birmingham were struck coins with the mint sign H under the women (image above) and at Royal Mint London coins without any distinctive sign. The coin pictured at right is struck at London, because it has no distinctive sign. The pictures of the coin minted at Heaton on this page and the information about the fact that the coins without mint sign were struck at London are present on the site through the contribution of Mr. Cristian Ciuplea. 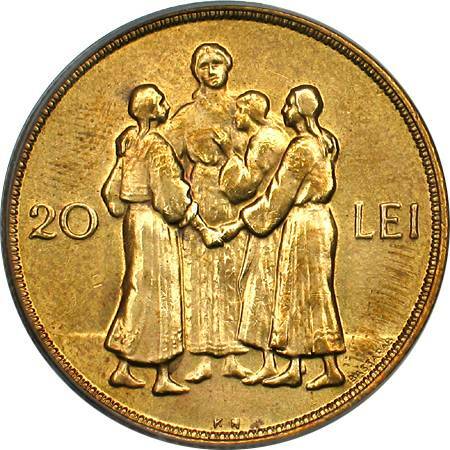 The pictures of the coin struck at London and of the coin struck at King's Norton are present on Romanian coins through the kind permission of an anonymous donor. From the total number of 50.000.000 coins, at London were struck 40.000.000 pieces and 10 millions at Birmingham, 5.000.000 at Heaton and the same number at King's Norton. In Monede şi Bancnote Româneşti (Romanian Coins and Banknotes, 1977) it is mentioned that the coins with H and without mint sign were struck both at "Heaton, London". But the coins struck at Heaton were (usually) marked by an H, and Heaton Mint functioned always at Birmingham, never at London. In conclusion, the use of the Heaton Mint name in this case is an error. The coins without mint sign were struck at Royal Mint London. 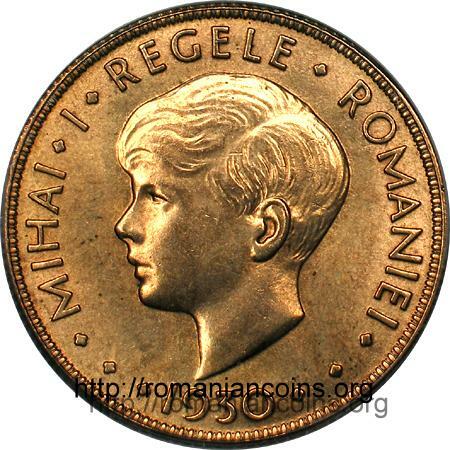 The 1930 coins of Mihai I circulated very little due to his being overthrowned by his father Carol II, the same very year. 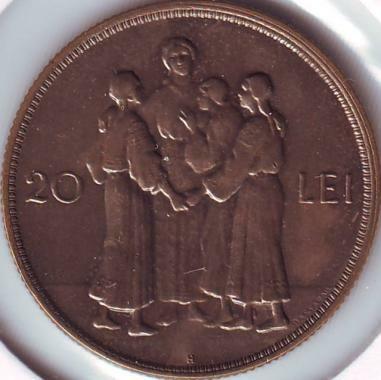 Somehow rare and dear, this coin is almost impossible to be found in good condition. Among the numismatists it is known as the Hora or the Hora Coin. I found, to my surprise, when consulting an instance of the Webster dictionary, that hora is considered to be also an English word. Webster's description puts it: a lively Romanian and Israeli folk dance performed in a circle. 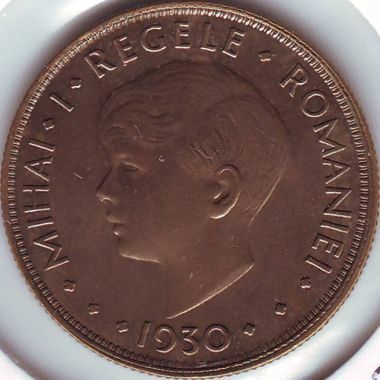 The fact that no one seems to be capable of reading this coin should be only taken into account as embarassing for Romanian numismatics and numismatists both. 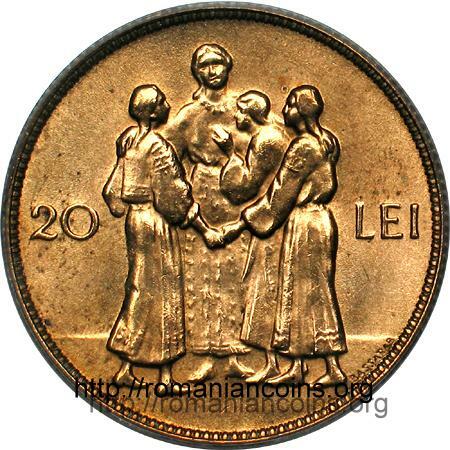 The four characters have not been pictured dancing, as the word went to a wide spread and is still going among Romanian coin collectors (id est Hora), instead the coin displays the Great Romania Allegory. The Great Romania Allegory: Mother Romania greets back her daughters, Basarabia, Bucovina and Transylvania, that altogether returned to the MotherLand in 1918. This image was notorious in a not so far from now period of time. The rejoining encounter was immortalized (somehow unproperly said, as I will later point) in stone by sculptress Olga Sturza, the statue having been donated to the city hall of Iaşi (former capital city of the principality of Moldavia) on first of August 1924. 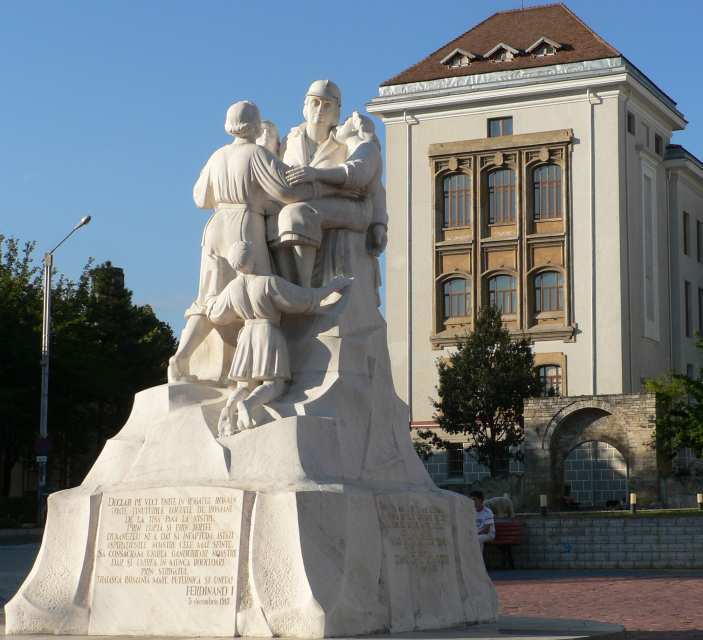 The work of art was placed on the very location where today resides the statue of Mihai Eminescu, at the feet of Copou Hill. The image below comes from a postal card printed in 1929. One may reckon that despite certain tiny differences it is the same allegory. 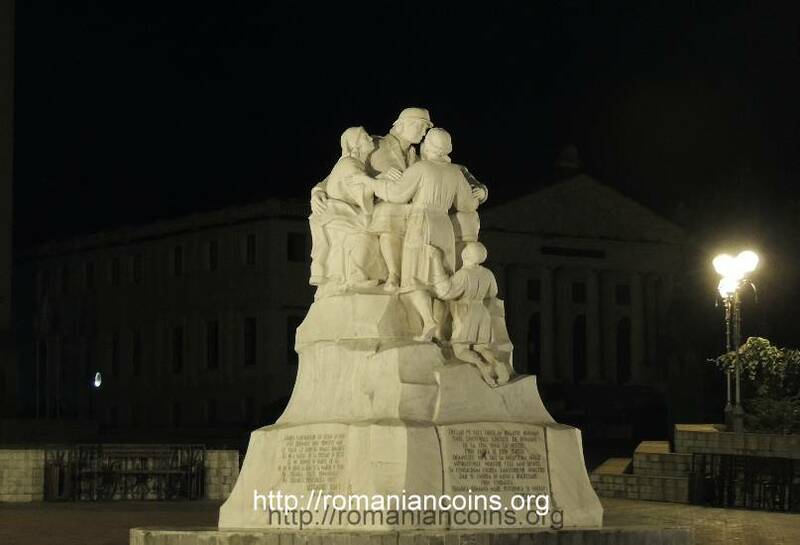 As you can see, a small child at the base of the statuary group is striving to reach to Mother Romania aside the other three daughters (clearer on the second picture). 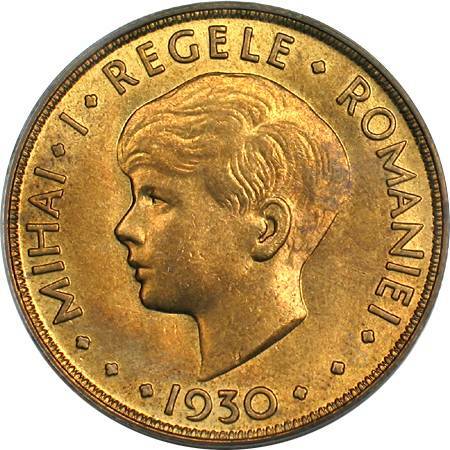 The child stands for all the Romanians left outside the boundaries set in 1919. 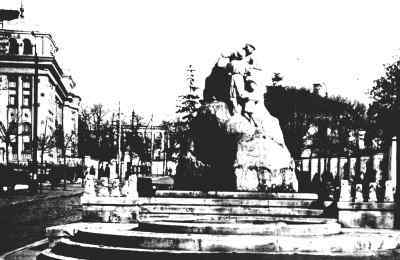 Shortly after the Russians entered Iaşi in 1944, the statue was hammered until unrecognizable, its shapeless remainders and reminders being removed a few years later. After the regime shift in 1989, under the administration of mayor Constantin Simirad, the statue was crafted again to initial parameters and emplaced this time right in front of the Medicine and Pharmacy University on the Independence Boulevard.